Chef Jessica Johnson, graduate industrial engineering student at St. Mary’s University, has made an educational and soon professional career out of a love for numbers, equations and anything and everything having to do with engineering. However, it doesn’t take a rocket scientist-or engineer-to solve a hunger problem with one of Johnson’s favorite, and easiest, dishes: Jessica’s Shrimp Scampi. Besides calculators and crunching numbers, Johnson loves one food above all else: pasta. “My favorite place to eat pasta is Olive Garden; I’ve been going there ever since I can remember,” says Johnson. With a childhood of pasta memories and a noted Italian restaurant as her inspiration, Johnson names her shrimp scampi as her favorite dish. 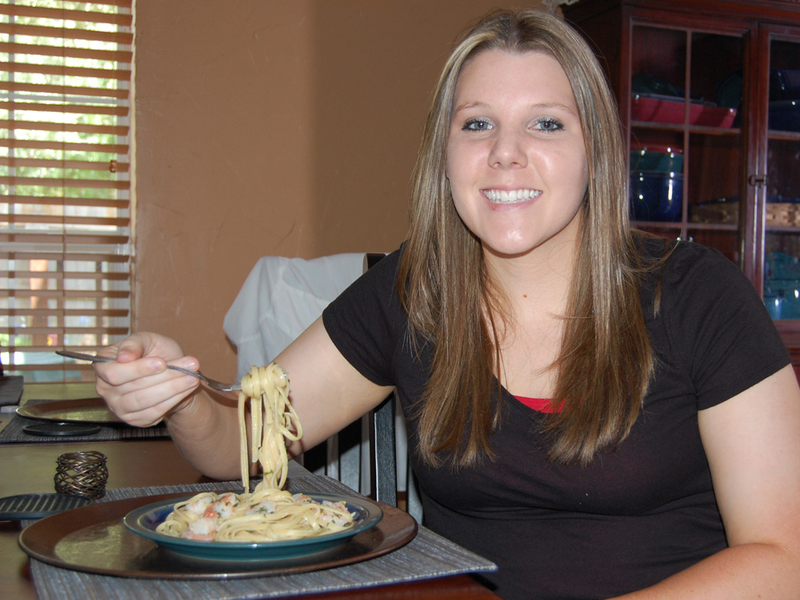 “I really like shrimp and pasta, so I would say it’s the perfect combination of the two. It’s also really easy to make,” Johnson says. Just as she has recreated her favorite dish out of past delightful experiences at Olive Garden, Johnson plans to recreate her successful education experience and pass her love of math and engineering on to others in the same place it started, St. Mary’s. “I would like to teach at St. Mary’s because I like the student/teacher ratio because it creates a better learning environment and I can connect more with the students,” says Johnson. Johnson also likes the personalized atmosphere of her education. “[My favorite thing about St. Mary’s is] that it’s small, and everybody’s really nice. It makes me feel like a person and not just a number in the student body” Johnson says. Johnson has created a formula for her happiness that requires a personalized, pleasant, and sometimes delicious experience in many areas of her life. In her downtime of long division, fractions and differential equations, Johnson enjoys a different type of ‘A’ grade in the form of the sizzling, lemon zesty Jessica’s Shrimp Scampi. In creating this refreshing dish with the splash of lemon, Johnson has some extra credit tips for its preparation. In boiling the linguine, she suggests eating one of the noodles before draining and adding them to the dish to make sure they are completely cooked as well as pouring a cap full of vegetable oil to the water to help it boil faster before adding the linguine. The mathematical guru notes the easiest way to zest a lemon is to use a cheese grater and to flip the shrimp over frequently while sautéing for even pinkness. Whether it’s solving equations or appetites, Chef Jessica Johnson always cooks up the right solution.